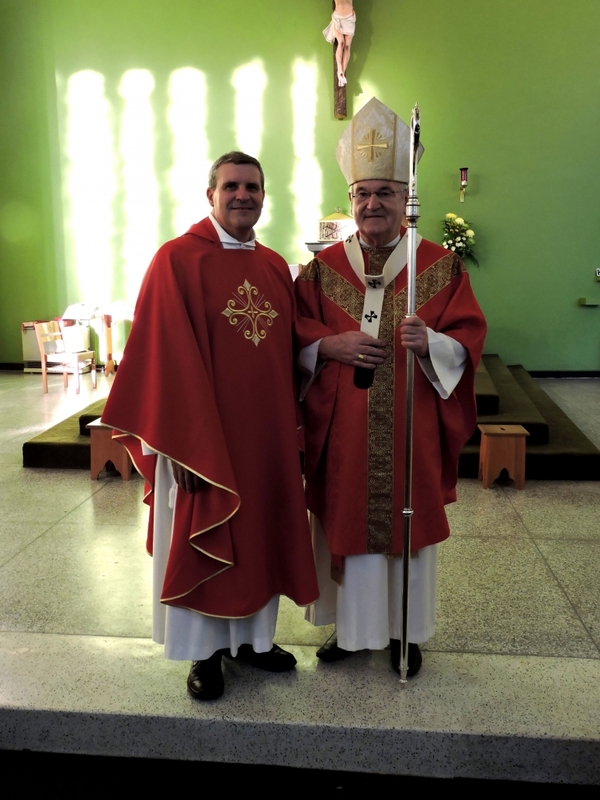 As the Catholic Church in England and Wales continues what seems to be a ‘season’ of Ordinations, the Archdiocese of Cardiff gave witness to the Ordination of a second priest this summer as Archbishop George ordained Fr. Peter Davies to the Sacred Order of the Priesthood. The Mass with Ordination took place at the church of St. Brigid, Crystal Glen in Cardiff on Friday 29th June 2018. Fr. Peter spent a number years ministering in the Church in Wales before becoming Catholic a few years ago. During his ministry he worked as a hospital chaplain at the university Hospital of Wales (the Heath), and upon his reception into the Catholic Church, continued to work at the hospital in a lay role. In this period he discerned with Archbishop George a calling to the priesthood within the Catholic Church with the support of his wife and family, and offered himself for service within the Diocese. As a priest Fr. Peter will continue to serve at the University Hospital as the full time Catholic Chaplain, bringing the Sacraments to the patients and witnessing to Christ’s abiding presence among them as he acts in persona Christi. Often when we get sick, we feel dejected and sometimes alone. The work Fr. Peter will continue to undertake and expand upon as a priest will no doubt be a source of comfort, healing and strength to those whom he meets. God bless you Fr. Peter. Ad multos annos.